Hobie Forums • View topic - Convert the TI cradles into a Dolly cart. Convert the TI cradles into a Dolly cart. Post subject: Convert the TI cradles into a Dolly cart. Thanks to sunEsailor and mkrawats for this idea! By adding some eyebolts to the Rhino HD roofrack bar it’s easy to convert it to a cradle type dolly cart. This was done using standard Rhino accessories and 30cm beach wheels I had on an underhull cart. I had all the bits on hand except the 16mm stainless axle. It's probably not worth it if you have to buy all the bits extra. It would be better to just get the Hobie cart. As I had the main parts already it only cost me about $20. 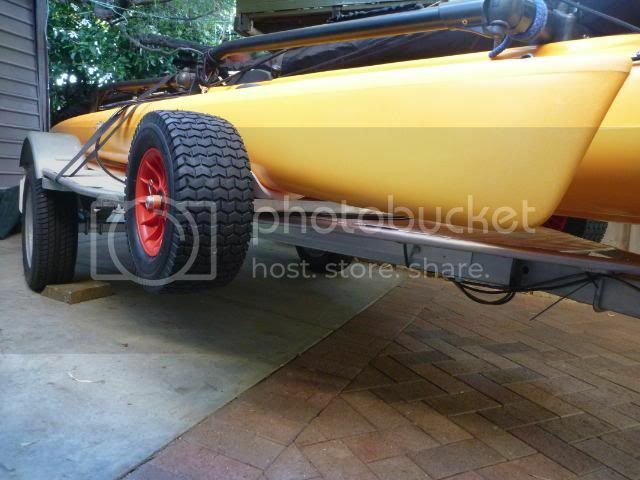 The Hobie cart is about $550 downunder. Add a couple of wheels and 16mm ss axles. The HD wheels also fit by using a spacer. Quick release clips make fitting easy. Makes retrieving the TI much easier. I still prefer the scupper cart for launching though! Last edited by stringy on Mon Nov 28, 2011 2:03 pm, edited 1 time in total. Post subject: Re: Convert the TI cradles into a cart. Do you prefer to launch with the scupper cart because you can stow it onboard and take it with you? I would be interested in your thoughts re this matter. I really like the simplicity of the scupper cart and prefer my modded Trax2 with the 4 wheels I’ve previously posted about. On my trailer I carry the TI above the AI so it's easy to insert the scupper cart and hold it in place with the cart keeper for removing it from the trailer. -it's very wide. It wouldn't have fitted down the beach access track where we stayed last Christmas. …..but it does make it easy to retrieve the TI and that’s where I’ll be using it most. Post subject: Re: Convert the TI cradles into a Dolly cart. You've come up with a very innovative modification to my original Appel Cart design; removable wheels... Very clever. At one time I thought about something like this, but could not find the necessary plastic fittings to make it like I wanted to. I was thinking about having an axle stub that would pop in and out of the end of the frame. The wheels would still be removable but then the axles would not be sticking out when not in use. I'm sure you love using your new cart, so much easier on the ole back huh. I realize you're using "spare parts" to save money but how are those 30cm wheels holding up for you, have you tried rolling on soft sand yet? Just a thought... 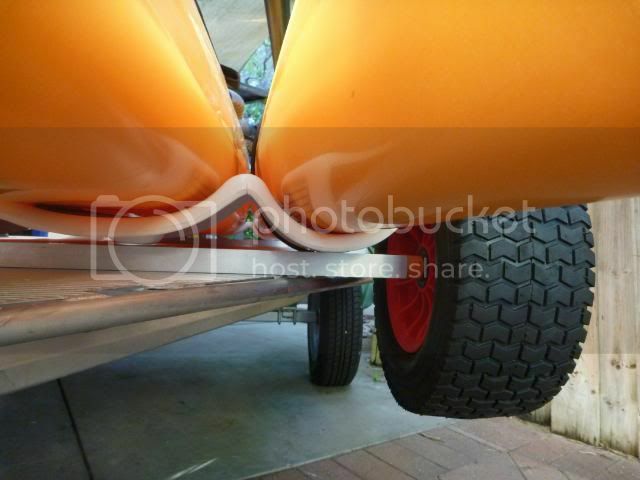 I put my cart way back towards the stern when I take my boat on and off the trailer. It acts as a temporary dollie at this point, keeping the stern off the ground until the boat is somewhat level. As the boat comes down, I slowly pull the cart forward towards the middle where it then balances out. The 42cm I use are slightly higher (12cm dia. difference). I don't ground out as long as I'm not on too steep of an angle, but getting the TI low to the ground was one of the 3 key design requirements that I had to overcome. I like what you've added, I am very impressed. Keep up the good work my friend! One of my local hobie mates has come up with the solution re a front mono swivelling front wheel. He lives on Raymond Island, just a couple of hundred metres from the water. Using the front swivelling trailer/caravan jockey wheel, locked into the empty mirage drive well - along with the HD scupper cart, he and his wife can effortlessly tow their AIs down to the waters edge. Unfortunately I don't have a photo of this invention. Initially i thought it might put too much stress on the mirage drive but they have been using it regularly now for almost 12 months with no adverse effect. I think i will be including this along with the dolly cart to launch the TI. I should add that they are towing it along a smooth bitumen road. It might work on other surfaces providing the front wheel was suitable for the terrain. With His current design the AI can be wheeled into the water and the front wheel removed in exactly the same way as the mirage drive. Thanks Mickey. In fact I use the same sort of idea for moving the AI around the garage and driveway. I keep the AI on a light trailer and use an old swivel office chair, with the back removed, under the trailer coupling. It makes it all so easy to move around and position it at the tow ball. That's what I'm talk'n about. Damn it, I was just about to invent one, go into manufacture and make a killing. The story of my life !!! Looks like it would work well NOHUHU ?? This was Tikis baby. We nudged him along. If you want to take the 3rd wheel to the next level, check out the drivewell axel ideas. First person to create a click and go mount will get braggin rights. Hey stringy, nice idea. I have not got my new TI yet (about two weeks to wait). I have to ask what width of Rhino rack bar did you need to fit the TI cradle? I see the HD Rhino rack comes in 1375, 1400 and 1500mm. Would the shorter 1375mm be wide enough for the cradle and wheels? Sorry for the late replies. End of year has been a bit hectic! Thanks for that and of course for your original idea. I haven't tried it in deep sand yet but I've been happy enough with those wheels when I used them on the cart they came with. Your bigger wheels would be better but it's a compromise between cost and size. The 42cm wheels are very expensive downunder. No I haven't added a front wheel yet, though I like the idea. Mickey's mates jockey wheel idea sounds promising. I've been using a second cart up front at times, either the C-Tug or the Anaconda Deluxe cart with the 30cm beach wheels. Welcome and congrats on the TI! I'm using those same 30cm wheels from the Anaconda cart. They fit nicely on a 16mm axle. The Rhino bars I used were 1800mm bars I cut down to 1430mm to fit with the framework on my trailer so they are a bit wider than the Hobie cradles (see the pic) which measure about 1200mm. I'd say a 1200mm bar would be OK but you may be safer with the 1375. The 16mm axle fits into the 6mm eyebolts after I ground a small flat edge on the axle. The eyebolts are attached using the Rhino 6mm bar plates from a Rhino basket fitting kit. Have to report that my Anaconda wheels worked well on soft sand but did not like being parked on a hot ashphalt pathway. One wheel went soft and developed a big bulge after only about 10 to 15 min in the sun parked on the hot foot-path whilst I was getting ready (and it was not a really hot day just under 30C). I have upgraded to this. I have ordered a second set of cradles so that I can have two mounted on the trailer and a third mounted on the removable section for the dolly. The wheels are heavy duty brickies wheelbarrow wheels mounted on a 1" heavy wall alloy tube (25mm with 3mm wall), which runs inside the rectangular section. At the moment I am still working out an easy quick release bracket and bolt to mount the trolly to the trailer and easily take it off. I still have not worked out a handle or leg for the dolly to stop it tipping forward when pulling the TI onto it on the beach. So thanks for the good ideas, it has really started me thinking of new ways to make it easy to cart this thing around. I will post when I have done a decent test run. Shame about the Anaconda wheels. I'll be careful to avoid hot bitumen! I've only ever used the balloon wheels over grass/sand. They have too much drag on hardpack. I'm still trying to come up with an easily portable yet supportive cart for the TI that is easy to use when retrieving. I've cut down one set of cradles to hull width and mounted that to a C-Tug via the same Rhino bar as in this post. The other option is to mount the wheels to the hull width Rhino bar (as above) and work out a way to hold the ama out so they miss the wheels. I'll be testing it thoroughly this week. The Hobie cradles mounted to the C-Tug cart were a failure. The C-Tug's high centre of gravity resulted in the cart tipping forward no matter how tight the strap was. The HD foam wheels also fit. This narrower dollycart make retrieving the TI a much simpler operation. I still prefer the scupper cart for launching though as the keeper pin is much simpler to use than strapping a cart on when the TI is on my trailer. I decided to modify the cradles so they fit my favourite all purpose cart. Using a hole saw I drilled holes for the cart posts. The cradles can now be used on a scupper cart to provide better hull support. The carts got a thorough test this last week and I'm happy with the results. One problem that needs improving is that the handle tends to undo the eyebolt when positioning the cart under the hull so I need to work on that. 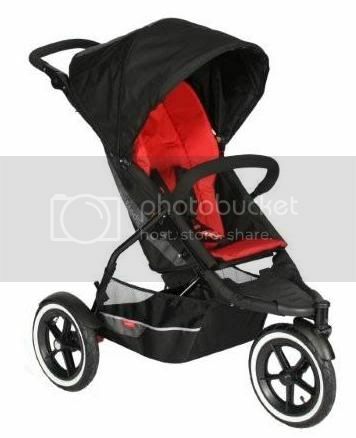 By tilting the scupper cart forward and repositioning the cradle you have a dollycart. It's only at the prototype stage. More details later.